Welcome to the first ever blog from your community of apartments in Medical Center! This week’s post is all about the best restaurants in the neighborhood, so let’s dive right in. Oh, one more thing — please be sure to share this post with any of your hungry friends and neighbors at your community of apartments near Medical Center. Alright, let’s get to it! This eatery is easy to find; just look for the giant yellow food truck! Gyro King jams as much food as possible into their gyros, bowls and combo platters, so you can rest assured that you’re getting the most bang for your buck. Gyro King can be super unhealthy or Whole 30 compliant — it’s your call. If you want to eat without worrying about calories, get the combo platter over rice. It’s $9 and you get super fresh lamb and chicken that’s smothered in their signature white and red sauces. If you’re on a diet, get the combo salad, which is the same thing without the sauce and rice. As you can tell, the Medical Center area is big on Mediterranean food. Unlike Gyro King, M&M Grill is a brick-and-mortar restaurant. It’s a hole-in-the-wall for sure, but sometimes those places have the best food. That’s certainly the case at M&M Grill, which has juicy double cheeseburgers, tender kabsa chicken and gigantic meat platters. The other thing that sets M&M Grill apart from Gyro King is the lack of healthy options. 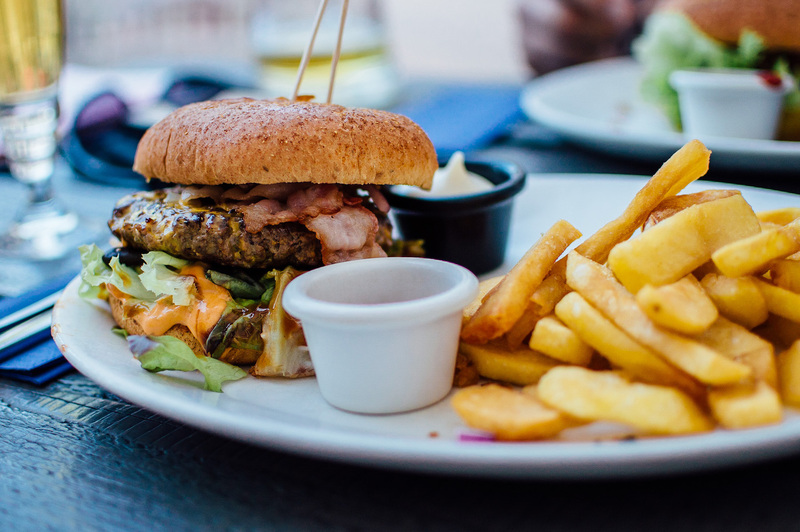 That’s not necessarily a bad thing — everyone deserves a cheat day — but don’t come here expecting to find anything that’s less than 500 calories. With a name like Houston’s Famous Deli, how can you not visit this place? It’s an adorable mom and pop deli with fantastic tomato basil soup, fresh sandwiches and a super friendly staff. What’s not to love? Oh, and the sandwiches are huge. The reuben is almost a foot long, so be prepared to save some leftovers. Anyone who’s ever been to France will love Eclair Paris. It’s a cute little cafe with great coffee and plenty of outdoor seating, but we mostly love it for the food. We don’t know the chef, but whoever it is must be French because everything is super authentic. They use real French cheese, prepare eggs in the traditional French way, and offer all the dishes that you’ve been missing since your junior year study abroad trip to France. The menu has both breakfast and lunch options, we we’ll recommend a dish for each meal. For breakfast, try the avocado toast. We know this isn’t a traditional French meal, but Eclair Paris makes it feel French by adding Boursin cheese on top of a soft baguette. For lunch, we recommend the signature Parisian sandwich. The fresh dijon mustard alone makes this sandwich a delight. This restaurant doesn’t look like much from the outside, but it’s got some of the best BBQ and seafood in Houston. They give you way more food than you can handle, and it comes without a hefty price tag. Try the BBQ shrimp, the chicken strips, and of course, the po-boy. With that, we’ve reached the end of our first blog post! Thanks for reading, residents! We’re always happy to help our residents get the most out of their time our community of apartments in the Medical Center, and we think these restaurants will help y’all do just that! If you enjoyed this week’s post and would like to read more like it, please be sure to bookmark this page. That way, you can easily check it in a couple weeks when our next blog goes live on the site. While you wait for that to happen, go ahead follow us on social media to stay up to date and informed about everything going on at Stella at the Medical Center!